Set 99 years after the events that occur in Lufia II, Lufia & the Fortress of Doom tells the story of a teenage boy from a small village, who is descended from the great warrior Maxim, and his childhood best friend, Lufia -- an orphan girl who first came to the town under mysterious circumstances. Together with a strong warrior called Aguro and a half-elf called Jerin, they get swept up in an ancient prophecy, which sees them fight a group of god-like warriors (The Sinistrals) in order to save the world, just as the great Maxim had done almost 100 years prior. The game covers just about every JPRG trope -- particularly the “save the world” premise, towns, world map traversal, the endless talk about destiny, and random encounters -- but it takes a few interesting turns (including a boss fight in the introduction) and has many memorable characters. 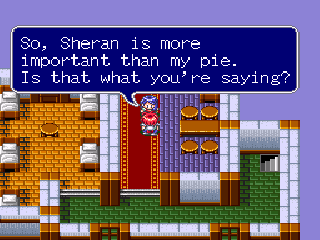 The lead female protagonist, Lufia, is especially charming, and has a very bittersweet character arc. Unfortunately, the overall character development feels somewhat under-done, and the player is too often left to guess at the motivations, desires, loves, and hates of Lufia’s leading stars. Charm can only get a story so far; some will be unable or unwilling to invest in these characters whose personal journeys are never completely related within the game. It couldn’t help that the dungeon and battle mechanics are somewhat bland and derivative. 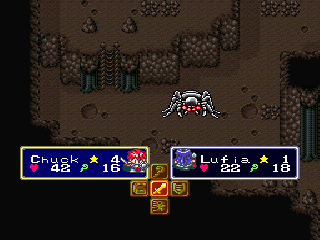 While Lufia II would later add on-screen monsters and turn-based movement, in addition to Zelda-esque puzzles, to the dungeons, the first Lufia game offers only rudimentary puzzles and (too-)frequent random encounters. The battles feel (and play-out) almost exactly like Dragon Quest games of the era, except with perhaps a little less-balance and a slightly slower-pace. The problem here, though, is not the lack of originality, but rather the lack of clarity in how your instructions affect the situation. I had to learn what effect items have through trial-and-error. 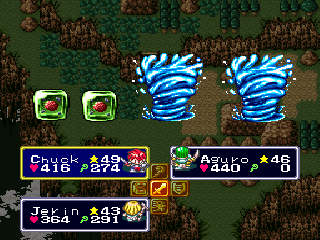 The turn-based combat is implemented in such a way that the order of turns is sometimes quite different to what I expected. Often I would be prompted for instructions to two of my party members, then an enemy would attack before I was prompted for instructions to a third character. But to my bewilderment it would sometimes be the third character that would act first, even though the delay suggested that character would act later. 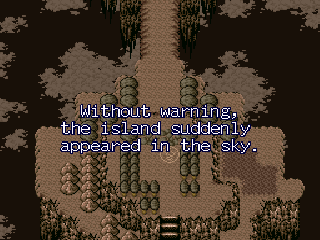 There is no Final Fantasy-style "wait" gauge to give a visual indication of the ordering of turns, nor is there a Dragon Quest-style of prompting for all actions at the beginning of each turn. Instead it uses the rather murky system of prompting at irregular intervals and acting out turns differently to what is suggested on screen. But the battles quickly become wearisome and are far too frequent. These complaints may be considered minor and insignificant, but I think they betray a lack of thought in the battle mechanics. Moreover, they hide the inner workings of the system; they offer insufficient transparency for a game so heavily reliant on probability, statistics, and mathematical formulae. It is a role-playing game, after all. And role-playing games are heavily reliant on fixed rules and dependencies, and relationships between attributes and player skills. 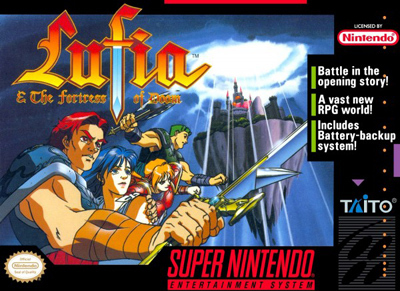 All of this begs the question: why play Lufia & the Fortress of Doom? There are many better games than this one. Plenty of JRPGs tell a better story, have more interesting battle mechanics, better level or world design, or explore a more interesting and original concept. And its successor, Lufia II, is superior on almost all counts. But there are few games that I have found as charming as this one. None of the problems with Lufia were great enough that I could not still enjoy the game. Its exceptional music certainly helps in this regard. Stand-out tracks include the battle themes, Pulifia Flowers, A Reunion, and Parting. The graphics are simple and blocky (though largely on a par with its contemporaries), and the animations limited and uninspired, but Lufia’s art style nevertheless exudes plenty of charm, much like its story and characters. 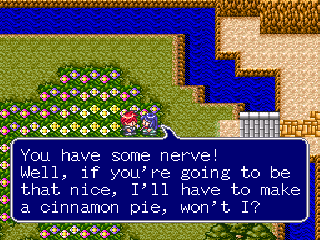 Lufia really is more than the sum of its parts -- you just need to give it a chance. 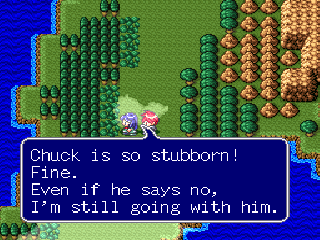 The relationship between Lufia and the Hero is entertaining and toucing. Does Lufia & the Fortress of Doom hold up against the more highly-regarded JRPGs of the 16-bit era? What's your favourite Lufia game? And what is your favourite JRPG? Let us know your thoughts in the comments.